Chapati is a staple food in India. However, process of making a chapatti is a complex and tedious. But today, no domain has been untouched by technological advancement and so does this. Many manufacturers have come up with an exclusive line of Chapati Making Machines which make it possible for the restaurant owners to quickly make numerous Chapatti easily. The machine has been effective in reducing the manpower while enabling the users to make round, soft, and well-cooked chapatti easily. Food industry, especially caterers and restaurant owners use Chapati Making Machine extensively to feed a large number of guests at a time. These are electrically operated machine with the capability to make 1000 chapattis in an hour. The machine is made up of stainless steel which is segregated in two parts. The first is for making dough and dough balls and other one is for pressing the balls into chapattis and finally baking them. Most of the machines have compact design which can be easily fitted in the kitchen. However, semi-automatic chapatti making machines are also available in the market that requires an operator to manage the process. These machines can be also be used to make puri, small chapatti that are fried and baked. 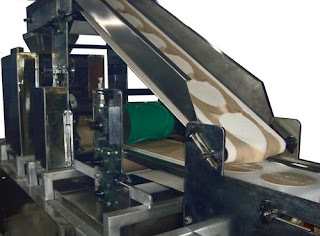 Average speed of make puri in an Automatic or Semi-automatic machine is up to 10,000. Here are some of the advantages of the machine that will surely compel you to buy the product. Market is flooded with the Chapati Making Machine Manufacturers. However, the most important aspect is to find the reliable manufacturers and suppliers from the crowd, who can make available high quality machines at competitive prices while assuring on time delivery. Additionally, there are many Chapati Maker Suppliers and Exporters who provide both automatic and semi-automatic machines. Be specific about the uses and accordingly spend on the machine. We would suggest you to opt for Automatic Chapati Maker and also compare the prices before buying.